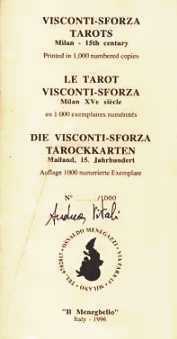 Booklet attached to the Visconti-Sforza Tarot deck printed in 1.000 numbered copies by "Il Meneghello" Edition of Osvaldo Menegazzi. Four cards missing from the original deck have been included: the Devil, the Tower, the Horse of Pentacles, the Three of Swords. They have been specifically reconstructed for this special edition by the miniaturist Giovanni Scarsato of Milan.